Dr. Emily Hall joined the staff at Mote Marine Laboratory in the Chemical Ecology Program in 2005 where she was most involved with research and monitoring of nutrient patterns in relation to harmful algal blooms in the west-central coast of Florida, and investigating sources of nutrients in aquatic systems. Dr. Hall currently manages the Ocean Acidification Program where she has developed ocean acidification and climate change experimental systems (in the Florida Keys - OAFTERU and in Sarasota - OASys) to study the effects of global and local variables on coral reef ecosystems as well as on other marine organisms. Ocean acidification (OA) and climate change are occurring due to the increased rate of anthropogenic CO2 in the atmosphere and the ocean. Understanding the effects of these global problems on marine organisms is a top priority. The implication and evidence are that increases of pCO2 along with increased temperatures (and combined with other environmental variables) will affect multiple critical biological components of marine ecosystems. 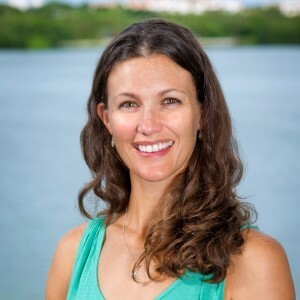 Dr. Hall is also focusing her research on unique coastal and marine habitats that may be able to withstand or alleviate the effects of global changes on organisms like corals, such as within seagrass beds or offshore deep holes. Dr. Hall is an adjunct professor at Ringling College of Art & Design, where she initiated cooperative work between the artists at Ringling and the scientists at Mote to produce public outreach tools for marine and coastal awareness known as "The Art of Marine Science" and she is courtesy faculty at USF-SM where she has taught chemistry and research methods courses. 2018 Hall, E.R., E.M. Muller, T. Goulet, J. Bellworthy, K.B. Ritchie, and M. Fine. 2018. Eutrophication may compromise the resilience of the Red Sea coral Stylophora pistillata to global change. Marine Pollution Bulletin 131:701-711. 2017 Muller, E.M., N.M. Leporacci, K.J. Macartney, A.G. Shea, R.E. Crane, E.R. Hall, and K.B. Ritchie. Low pH reduces the virulence of black band disease on Orbicella faveolata. PLoS ONE, 12(6): e0178869. 2016 Banc-Prandi G., K. Imhof, E. Hall, and K. Ritchie. Interspecific coral bacterial competition under ocean acidification scenarios. Proceedings from the 13th International Coral Reef Symposium, Honolulu: 58-70. 2015 Hall, E.R., B. DeGroot, and M. Fine. Lesion recovery of two scleractinian corals under low pH conditions: implications for restoration efforts. Marine Pollution Bulletin, 100:321-326. 2014 L.K. Dixon, G.J. Kirkpatrick, E.R. Hall, and A. Nissanka. Nutrients on the west Florida shelf: patterns and relationships with Karenia spp. occurrence. Harmful Algae, in press. 2014 Heil, C., L.K. Dixon, J. Lenes, M. Garrett, E. Hall, L. Killberg-Thorsen, D. Bronk, K. Meyer, B. Walsh, J. O Neil, L. Procise, M. Mulholland, G. Hitchcock, G. Kirkpatrick, R. Weisberg, and J.J. Walsh. Nutrients, management and Karenia blooms: sources, sinks and cycling of nutrients to Karenia brevis blooms in the eastern Gulf of Mexico. Harmful Algae, in press. 2012 Hall, E.R., D. Vaughan, and M.P. Crosby. Development of ocean acidification flow thru experimental raceway units (OAFTERU). Proceedings from the 12th International Coral Reef Symposium, Cairns, Australia. 2012 Hall, E.R., K. Nierenberg, A.J. Boyes, C.A. Heil, L.J. Flewelling, and B. Kirkpatrick. The art of red tide science. Harmful Algae 17:1-5. 2010 Hall, E.R., B.A. Pederson, L.K. Dixon, and G.J. Kirkpatrick. Patterns in community structure of phytoplankton in relation to environmental data in Sarasota Bay. Report to the Sarasota Bay Estuary Program. Mote Marine Laboratory Technical Report No. 1417. 2010 Dixon, L.K., E.R. Hall, and G.J. Kirkpatrick. A spectrally explicit optical model of attenuation for Charlotte Harbor seagrasses. Report to the Charlotte Harbor National Estuary Program. Mote Marine Laboratory Technical Report No. 1460. 2008 Hale, J.A., R.M. Duffey, B.A. Pederson, and E.R. Hall. The Sanibel River and the Impaired waters rule: how stable nitrogen isotopes and phytoplankton community analyses can indicate nutrient sources and evaluate nutrient reduction efforts. Report to Natural Resources Department, City of Sanibel. 2005-2012 Pierce, R.H., E. Bartels, L.K. Dixon, E.R. Hall, M. Henry, B. Kirkpatrick, G.J. Kirkpatrick, B.A. Pederson. Mote/FWRI cooperative red tide research program: monitoring, prediction and mitigation of Florida red tides. Reports to Florida Marine Research Institute. Mote Marine Laboratory Technical Reports.